Since acquiring THX, gaming hardware brand Razer has gone on to introduce the first THX-certified laptop and computer speakers, and now it’s introduced an amped-up gaming headset at IFA 2018. Meet the Kraken Tournament Edition headset, the first gaming headset to feature THX Spatial Surround sound. This technology not only simulates the usual 7.1 surround sound for immersion from all sides, but it also distinguishes sounds coming from below and above to create a complete 'sphere' of audio. For example, users will supposedly be able to hear the panoramic motion of sounds like a plane whizzing past and above them. Lastly, it's claimed that THX Spatial Surround can track which way you’re facing in-game to deliver truly directional audio. In addition to this headset’s impressive spatial audio capabilities it features cooling gel-infused ear cushions, hidden eyewear channels for those who wear glasses, and an ultra-soft padded headband. You’ll also find a USB Audio Controller attached to the Kraken Tournament Edition headset, offering on-the-fly bass level adjustment and game/team chat balance mixing. The Kraken Tournament Edition will be available this September for $99 (£99, AU$149). 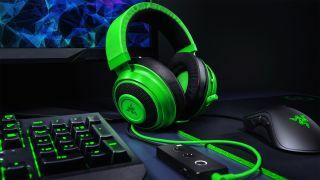 Razer also rolled out significant updates of two of its most iconic peripherals, the Blackwidow Elite keyboard and Mamba Wireless gaming mouse. The Blackwidow Elite gains the sturdy, dual-walled mechanical switches from the BlackWidow Ultimate and the multi-function digital dial of the Huntsman Elite. Razer notes that this is also its first keyboard to feature "hybrid on-board memory and cloud storage," allowing users to save up to five profile configurations created using Razer’s Synapse software. Meanwhile, the Mamba Wireless is the latest version of Razer’s flagship mouse, and now features the Lancehead’s Adaptive Frequency Technology, which scans and switches to interference-free frequency channels in millisecond intervals. Also new on this gaming mouse is Razer’s 5G Advanced Optical Sensor, which the company claims to feature true 16,000 DPI and a resolution accuracy of 99.4%. You also get Razer’s new hybrid on-board storage system on this gaming mouse, and up to 50 hours of use on a single charge. The Razer BlackWidow Elite is available now for $169 (£169, AU$299), while the Razer Mamba Wireless will arrive in September, priced at $99 (£99, AU$169).